Jane Grey remains one of the most compelling and tragic figures in Tudor history. She possessed royal blood through her grandmother, Princess Mary Tudor, and this heritage brought her to the scaffold in 1554. Jane had been named heiress to the English throne in her great-uncle Henry VIII‘s will, but only if his son Edward and daughters Mary and Elizabeth died without issue. But Edward ruled for just six years and his ambitious advisor, John Dudley, was determined to remain in power. To that end, he persuaded Edward to write his own will and leave the throne to his pious cousin, Jane Grey. Though just fifteen at the time, she was known for her Protestant piety and learning; it was this religious devotion which persuaded Edward to alter the succession. Deeply pious himself, he could not leave the throne to his Catholic sister, Mary. Jane was quickly wed to Dudley’s son and crowned queen of England in July 1553. But she ruled for just nine days, trapped and unhappy. Mary Tudor claimed the throne with great popular support and Jane was imprisoned in the Tower of London. 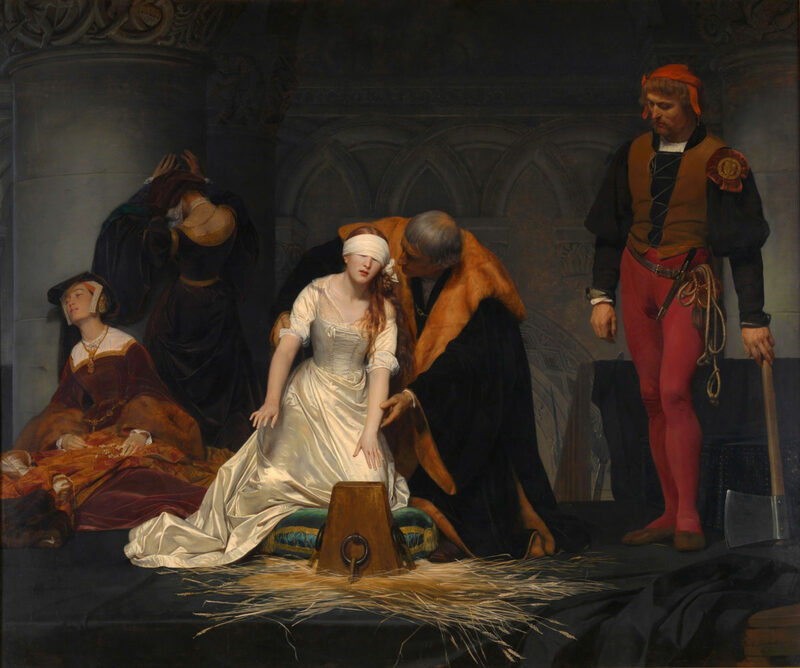 Her subsequent execution was a political necessity for Mary Tudor. Despite her youth, Jane met her end with great dignity and courage. Lady Jane Grey was the eldest child of Lord Henry and Lady Frances Grey, the duke and duchess of Suffolk. She was a viable heir to the English throne because of her maternal grandmother, Princess Mary Tudor. After the death of her first husband, King Louis XII of France in 1515, Mary secretly wed her true love, Charles Brandon. Brandon was her brother Henry VIII’s best friend; the king’s friendship and Brandon’s service to the Crown led to his creation as duke of Suffolk in 1514. He and Mary had a son, Henry, who died as teenager. Their next eldest child was a daughter, Frances. Under the terms of the Third Act of Succession (1544) and Henry VIII’s last will and testament (1547), the Suffolk line would inherit the throne after Henry VIII’s children died childless. In other words, the throne would pass to Henry’s son Edward; if Edward died childless, it passed to Henry’s eldest daughter Mary; if she died childless, it passed to Henry’s youngest daughter Elizabeth. If Elizabeth died childless, the throne passed to Lady Frances. This plan completely disregarded the children of Henry’s elder sister Margaret, the former queen of Scots. Henry did not care for Margaret and, more importantly, did not want the English throne in Scottish hands. So it was through Princess Mary that Jane Grey was bequeathed her deadly heritage. Still, no one in the 1540s expected the Suffolk line to rule. After all, Henry VIII had left three heirs and it was unlikely all three would die childless. Of course, we know that this did occur and the Tudor dynasty died with Elizabeth I in 1603. It was only in 1552, with Edward VI’s health rapidly failing, that people realized there would be a succession crisis. According to parliament and Henry VIII’s will, Mary was Edward’s heir – but she was Catholic, in her late thirties, and never robust. Edward’s course of action removed the succession from the heirs of Henry VIII and gave it to the heirs of Henry’s younger sister, Mary. This was a tumultuous course for many reasons. For example, the king of France, Henry II, was raising Mary Stuart, Margaret Tudor’s granddaughter; he planned to marry this ten-year-old queen of Scots to his son and heir, Francois. By all the accepted laws of primogeniture, she had a better claim to the English throne than her Suffolk cousins. In fact, most European Catholics believed Mary’s claim better than her Tudor cousins, Mary and Elizabeth, since both were illegitimate by acts of constitutional and canon law. However, Mary of Scotland was in France – not England; also, the Suffolks were Protestant and she was not. Edward VI never considered leaving her the throne. The above paragraph illustrates the complexity of blood ties within the Tudor family. And since Mary Tudor was half-Spanish and thus cousin to the Holy Roman Emperor, the succession crisis interested most of the major powers of Europe – France, the Hapsburg Empire, Italy (the pope hoped to bring England back to his authority), and the Protestant princes of Germany. When Edward VI died in 1553, all of these nations waited to see who would triumph. Mary…. Elizabeth…. Mary of Scotland…. Jane Grey…. Which would become queen? Also, Europe waited to see how England would welcome a queen as their sole ruler. All of the possible candidates for the throne were women, an unprecedented occurrence. The only woman to attempt to rule England as her father’s sole heir had been Matilda in the 12th century; she had been forced out of the country by popular revolt and a male cousin named Stephen of Blois became king. Now it seemed the English had no choice but to accept a woman ruler. And because of the secret marriage of Mary Tudor and Charles Brandon, the first woman to rule England in her own right would be Jane Grey. Jane Grey was not close to her parents. Henry Grey was the marquess of Dorset; he became the duke of Suffolk in 1551. He married Mary Tudor and Charles Brandon’s eldest daughter Frances when she was sixteen. At the time, Grey was a ward of Brandon’s. He was also an appropriate match for a Princess’s daughter. The Grey family had an ancient and impressive lineage, originally receiving lands from Richard the Lionheart. Later, they rose to prominence under Edward IV; he had married Elizabeth Woodville, the widow of Sir John Grey and mother of his two sons. When she became queen, she tirelessly promoted the interests of the Grey family. In fact, her eldest Grey son, Thomas, was created marquess of Dorset during Edward IV’s reign. His son, also called Thomas, was a companion to Charles Brandon – soldiering with him in France in 1513 and journeying there a year later to celebrate Princess Mary Tudor’s wedding to the French king. In 1530, Thomas Grey died and Brandon became his son’s guardian. The marriage between Frances and the heir, Henry Grey, was a satisfactory way to join two noble families together. Their marriage was celebrated at Suffolk Place in London. Mary Tudor died some months later. Charles Brandon remarried, this time to an heiress called Catherine Willoughby. She bore him two sons (his son with Mary Tudor had recently died). When Brandon passed away in 1545, he and Catherine’s eldest son, called Henry after his late half-brother, became duke of Suffolk. He and his younger brother died of the dreaded sweating sickness a few years later. This left the dukedom of Suffolk vacant until 1551, when Edward VI would award it to Henry Grey. As mentioned, Henry VIII had left the throne to his children and, if they died without issue, “to the heirs of the body of the lady Frances our niece, eldest daughter to our late sister the French Queen lawfully begotten….” This meant that the Grey children (by this time Frances and Henry had 3 daughters – Jane born in 1537, Catherine born in 1540, and Mary born in 1545) had enhanced social status. In 1547, when the will was read, no one seriously expected them to gain more. Edward was small and blond, like his long-dead uncle Arthur, lacking Henry VIII’s robust athleticism and good health. But he was expected to live, marry, and provide heirs. Therefore, any immediate interest in the Grey children centered on how Edward would favor them. Understandably, it was thought that he might marry the eldest, his cousin Jane. They were the same age, both precocious, very serious, and fervently Protestant. Jane had been raised, with her two sisters, at Bradgate. This was the principal family home on the edge of Charnwood Forest. It was a beautiful and luxurious estate, suited to the Grey’s semi-regal status. Lady Frances was very conscious of her royal heritage and, as she grew older, became quite like her uncle Henry. She and her husband were well-known for their love of riding, hunting, hawking and gambling. They were not, however, the most interested of parents. In this, they resembled their aristocratic contemporaries. They provided very well for their three daughters. While Frances and Henry spent time in London, their daughters remained at Bradgate, in the hands of capable servants. Jane’s nurse was a woman called Mrs Ellen and would remain with her until Jane’s execution; her first tutor was probably the house chaplain, Dr Harding. The first ten years of Jane’s life, from her birth in October 1537 (the exact date is not known) to her residence in Katharine Parr’s household in 1547, are not documented. It is likely she received the typical upper-class girl’s education – its primary emphasis would be on instilling good manners and the ‘feminine’ virtues of obedience and docility. She undoubtedly learned needlework and was taught dancing and how to play some musical instruments. But neither of her parents were scholars and no one in the sixteenth century expected women to be well-educated. She may have visited London, accompanying her parents to Dorset Place in Westminster; she may have met her royal cousins. No one knows. But in March 1547, Lady Jane Grey finally emerges into the historical landscape. It was then that she entered the household of the dowager queen Katharine Parr, Henry VIII’s sixth and last wife. Katharine had retired from court upon Edward VI’s accession, though she remained close to London. Her dower manor, Chelsea, was in the suburbs. It was a comfortable brick home with modern amenities. Here, Katharine planned to live with the man she had longed to marry before Henry laid claim to her, Thomas Seymour, Edward VI’s uncle. She also brought with her the 13 year old Princess Elizabeth. Katharine Parr was justly celebrated for her warm and open nature; she was a good stepmother to all of Henry’s children, particularly the youngest two. A few weeks after Katharine and Elizabeth settled at Chelsea, Jane Grey came to join them. She was sent to acquire polish and learn social graces, a common practice for daughters of the nobility. Jane acquired much more than social skills at Katharine’s household. For the first time in her young life, she was truly happy. Katharine was a devout Protestant and the most intellectual of Henry’s queens. Her home was the center of the Protestant ‘New Learning’; there was instruction and frequent debates. Jane, quiet and studious by nature, thrived. And though her parents were Protestant, it was at Katharine Parr’s that she became devoutly committed to the faith. The Greys, after all, had become Protestants like many nobles – because it was a matter of political necessity. At Katharine’s, Jane became a Protestant because she truly believed in its tenets. This serious and intense study of faith would remain with her throughout her short life. During Edward VI’s reign, the Lord Protector was Edward Seymour, duke of Somerset. Katharine Parr had married his younger brother, Sir Thomas Seymour. Thomas was very ambitious and angered that his brother had so much authority while he had to be content with a baronetcy, a seat on the Privy Council, and the office of Lord Admiral. Thomas and Katharine Parr had planned to marry years before but Henry’s sudden interest in the twice-widowed heiress delayed their plans. Within months of his death, however, they were wed in a secret ceremony; the exact date is not known but it was probably April 1547. Their whirlwind courtship offended some but Edward VI gave them his blessing. Some people remarked that the new Lord Admiral would have preferred marrying Princess Elizabeth, such was his ambition. He certainly lacked the evangelical zeal of his new wife, always remembering important business when it was time for prayers. He possessed great charm, particularly with women and children; and his desire to advance his own career led to some indiscreet behavior – notably bursting into Princess Elizabeth’s bedroom in the early morning, still in his bedclothes, to tickle her awake. This was dangerous play for an ambitious man and a thirteen-year-old heiress to the throne. At any rate, Thomas had wed the dowager queen and she loved him passionately. Meanwhile, other supporters of his brother Edward, the Lord Protector, were also rewarded for their loyalty. John Dudley, for example, became earl of Warwick. Meanwhile, Thomas was also becoming interested in the other young heiress who lived with his wife – Lady Jane Grey. When news of Henry VIII’s will came out, he wasted no time in becoming friends with the Greys. He sent his most trusted friend and servant, John Harington, to talk to Jane’s father, Henry Grey. Harington was to use ‘all the persuasions he could’ to gain Jane Grey’s wardship and marriage rights. Later, Harington would say he never promised anything explicitly but Henry Grey remembered a guarantee that Jane would marry King Edward. On this basis, Grey sold his daughter to Seymour for the sum of £2000. Seymour paid a few hundred immediately, promising to pay the rest in installments. In other words, Thomas Seymour was hedging his bets – if Edward VI died unexpectedly (as Tudor boys often did), he could arrange something with the Princess Elizabeth. If Edward lived, he could gain influence by marrying his ward, Jane Grey, to the king. Jane, of course, was oblivious to Seymour’s plans. She remained in Katharine Parr’s household, moving from Chelsea, to Hanworth in Middlesex, or Seymour Place in London. Her sensitive and eager mind, long starved for affection and knowledge, was finally engaged on a course of study – Latin, Greek and modern languages as well as religious instruction. As relations between the Seymour brothers deteriorated for a variety of reasons, Katharine Parr became pregnant. About halfway through the pregnancy, she happened upon a very unpleasant sight – her husband and stepdaughter, Princess Elizabeth, locked in a passionate embrace. Katharine’s reaction was a testament to her good character. She successfully averted an ugly scandal; a few weeks later, Elizabeth and her household staff were sent to Cheshunt on a visit to old family friends. She parted from Katharine with real affection and sadness; Elizabeth undoubtedly felt embarrassed and guilty. Jane Grey remained with Katharine. There is no evidence she was ever particularly close to Elizabeth; the gulf between nine and thirteen is great. Though they lived in the same homes for over a year, there are no surviving letters or reminisces. Perhaps Jane was grateful for Elizabeth’s departure; the princess was described as proud and disdainful, not good company for a shy child. On 13 June 1548 Jane accompanied Katharine and Thomas to their Gloucestershire estate, Sudeley Castle. On 30 August Katharine gave birth to a baby daughter, Mary; within a week, the dowager queen was dead, buried in the chapel at Sudeley. She was yet another victim of puerperal fever. Jane Grey, small for her age, freckled and with red hair, acted as chief mourner. Meanwhile, her parents were becoming restless. More than a year had passed since Seymour purchased their daughter’s wardship. In that time, no match had been made with Edward VI. Also, they wondered if it would be better to marry Jane to the Lord Protector’s son. They wrote to Thomas Seymour, consoling him on the loss of his wife and remarking that, since Katharine was dead, her household would be dispersed – therefore, Jane should be sent home; Seymour was not to be outfoxed. He wrote that his own mother was coming to Sudeley, to take charge of Katharine’s household (none of which would be dispersed); she would be ‘as dear unto Jane as though she were her own daughter.’ He did let Jane go home briefly in September. It was undoubtedly an unpleasant journey for the young girl. However, Seymour was able to regain her parents’ favor. He stressed his determination to wed her to Edward (the greatest prize) and agreed to pay another £500 on his bond. The Greys were chronically short of cash and wanted this grand marriage. Jane returned to the Seymour household. But the noose was tightening around Thomas Seymour’s neck. He had been boasting about his intent to destroy his overbearing brother and he had encouraged gossip that he would marry Princess Elizabeth. This gossip was perhaps the most damaging, particularly to the eyes of the young king. Was Seymour attempting to seize the throne? John Dudley, earl of Warwick, had long waited for the opportunity to destroy the Seymour brothers. He wanted to be Lord Protector himself and was quite prepared to turn on his old friend, Edward Seymour. He used the arrogant and ambitious Thomas to destroy them both. On 17 January 1549, Thomas Seymour was arrested at Seymour Place in London. Jane Grey was immediately brought home by her alarmed parents. Because Parliament was in session, it was decided that Thomas would not have a trial – instead a bill of attainder was drawn up and passed through both houses in early March. All that was needed was for the Lord Protector to sign the bill. For about a week, Edward Seymour did nothing. He was understandably hesitant to execute his brother. Seizing his chance, Dudley urged the council to appeal to the king – flattering his authority, they asked for him to sign the bill so they could proceed without further troubling the Protector. Edward cared little for either of his uncles (the Protector kept him short of pocket money and assigned him cold-hearted tutors.) He signed the bill. On 20 March 1549, Thomas Seymour was executed on Tower Hill. Meanwhile, Dudley moved to take control of the government. The year 1549 was marked by discontent – rising prices, high unemployment, bad harvests; also, people resented the radical religious changes passed since Henry VIII’s death. There were two serious revolts, in the West Country and Norfolk, both of which alarmed the land-owning gentry. Seymour had once been popular with the common people but his execution of his own brother struck many as cold-blooded and evil. Dudley had counted on this reaction. He also counted on the support of the gentry; he was a capable soldier and put down the rebellion in the West Country. This pleased the landowners and the king. Also, it allowed Dudley to gather a well-armed and experienced group of soldiers about him. On 10 October, he and his supporters captured the fleeing Edward Seymour at Windsor Castle. He was arrested and taken under guard to the Tower. Dudley became one of the six prime attendants on the King but – very intelligently – did not take the title of Lord Protector. Dudley was on the list of sixteen executors Henry VIII had appointed in his will. In 1543 he had been appointed Lord High Admiral, a post he relinquished reluctantly to the unqualified Thomas Seymour; in 1549, he regained that title. He was also a family man with several sons. But Dudley had learned from his dealings with Henry VIII; he knew to treat Edward not as one of his own sons but as a king. He flattered the king, allowed him greater access to money, more physical freedom. Luckily for Dudley, his coup coincided with Edward’s own physical maturity. He became a sportsman, which Dudley encouraged, and began to travel a bit outside of London. His cousin Jane was not so fortunate. She had returned to a home devoid of affection which also included physical abuse normal in the sixteenth-century (smacks, pinches, and the like). The Greys were discovering that their daughter had matured into a thoughtful, intelligent, and self-righteously pious young woman. She openly disapproved of their lack of piety, their devotion to material gain and social advancement, as well as their gambling. They were happy to hire a tutor, John Aylmer, to continue her education – and take her off their hands. Aylmer was a friend of Roger Ascham, the former tutor of Princess Elizabeth. On a visit to Aylmer, Ascham met Jane Grey; she impressed him greatly. He preserved their meeting in his educational treatise, The Schoolmaster. Were the Greys really such terrible parents? There is no doubt that Jane and her parents were not affectionate to one another. Yet this was normal in an age which expected children to be dutiful and obedient and that discipline built character. In fairness to them, Jane was openly critical of their pleasure-loving lifestyle. She encouraged the chaplain to deliver sermons against gambling, told visitors that she found her parents foolish and irritating, and she was very self-righteous. What parent would enjoy the company of such a devout thirteen-year-old? At home, Jane met John ab Ulmer, a Swiss Protestant and student of Henry Bullinger, chief pastor of the Protestant church in Zurich. They were both friends of Aylmer and Ascham. The four men corresponded about the education of this most pious young girl. There are many surviving letters – Jane thanking Bullinger for sending a copy of his treatise on Christian Perfection – and some reveal her as more than a pious Protestant martyr. In one, Aylmer is concerned that she is taking too much of an interest in music and her appearance. He was distressed – but what good news for the student of Jane’s life! She is human, after all. Of course, the European reformers were hopeful that Edward VI would marry this most proper cousin. Their union would make England a most blessed Protestant realm. But Jane turned fourteen and was still not betrothed to anyone while Edward was in serious talks to wed the French princess Elisabeth. Meanwhile, Charles Brandon’s two sons with Catherine Willoughby had died. This meant that their half-sister Frances Grey was sole surviving heir to the Brandon estates. On 4 October 1551, the title of duke of Suffolk was given to her husband in right of his wife. And on 11 October, just a week later, Dudley was made duke of Northumberland; two years of Edward’s favor had sufficiently emboldened him to petition the king. He was the first man to receive a ducal title who had no ties of marriage or blood to the reigning royal family. For Jane Grey, that week in 1551 was to have terrible consequences. The political situation in England during Edward’s reign is fully explored in the Edward VI pages. Suffice to say, the duke of Northumberland, John Dudley, had replaced Edward Seymour as the true power behind the throne. In spring 1552, his young master fell ill. No one was especially concerned; Edward VI had been ill before and recovered well enough. But this time he did not fully recover. It seemed as if his physical resemblance to the long-dead Prince Arthur went beyond their fair coloring and delicate physique – they were both consumptive as well. This naturally terrified the Protestant lords who had prospered during his six-year reign. The Princesses Mary and Elizabeth were rarely seen at the king’s court, Mary in particular. She could no longer persuade herself that Edward was simply a misguided Protestant pawn. He had, like Henry before him, ordered her to change her religion; he was king and expected obedience. He was closer to Elizabeth (only 4 years older than him) and she was suitably Protestant. But she, too, was rarely at court. His Grey family, however, was increasingly present. When Mary of Guise, mother of Mary queen of Scots and regent of Scotland, visited England in November 1551, Mary and Elizabeth were not invited. But Frances and Henry Grey were there, bringing their fourteen-year-old daughter Jane. Mary of Guise’s two-day visit to Hampton Court was Jane’s official debut on the English political scene. In early February, Jane contracted an unspecified illness. It was serious enough to warrant mention from Aylmer (in a letter to Ascham.) After her recovery, Jane’s parents persuaded her to devote less time to study and more to social concerns. Of course, an educated and pious daughter was an asset but they also wanted a daughter who could attract a king in marriage. On 2 April 1552, Edward became ill with the measles. As mentioned, he recovered somewhat – enough to attend St George’s Day services at Westminster Abbey. He also jousted, played on the tennis courts, and went hunting. And on 27 June, he began his most extensive progress through the south and west of his kingdom. The king enjoyed himself (he had never traveled so far outside London) but the pace was exhausting; combined with the illness in April and his strenuous athletics, it wore him down. Passer-by thought he was ill; he was pale, losing weight, and lost his appetite. He returned to Windsor in mid-September. By then, the tuberculosis which killed him had begun in earnest. By Christmas 1552, his condition was obvious. The holiday celebrations were unusually festive, perhaps to take notice from the king’s health. Princess Mary came to visit in February but his illness prevented their meeting for three days. Still, the king’s illness meant an increased respect for Mary, his heir under Henry VIII’s will. The exact nature and course of Edward’s illness is discussed at the Edward VI page. It was tuberculosis, or consumption as it was then called. On 11 April 1553, Edward moved his household to his favorite residence, Greenwich Palace. He had managed to open parliament in March but those who hadn’t seen him since the holidays were shocked at his appearance; he was terribly thin and, oddly, his left shoulder seemed higher than his right. It was obvious Edward was suffering terribly. Northumberland, his closest advisor, was torn – he talked of retiring from political life but this was a passing dream. He had made too many enemies – particularly the Catholic nobles and churchmen who would rally around Mary. In truth, if Mary succeeded, the best Dudley could hope for was complete financial and political ruin. More than likely, he would lose his head. He could, of course, attempt to marry Princess Elizabeth to his one remaining unmarried son, Guildford. Why didn’t he? It certainly seems less convoluted than attempting to place Jane Grey on the throne. The truth was that Elizabeth Tudor, nearly twenty years old, had seasoned political acumen – she would never be Dudley’s pawn. Dudley knew her well enough to guess as much. Therefore, only Jane Grey (fourth in line, after her mother Frances) remained. She would be amenable enough, the duke thought. Certainly Frances and Henry were happy enough to encourage Dudley. With Edward dying, there was no possibility of Jane marrying him. They may have been put off by Dudley’s ambition; he first attempted to marry Guildford to Eleanor Brandon’s only child, Margaret Clifford (Eleanor was Frances’s younger sister.) But, swayed by the prospect of wealth and power, they agreed to marry Jane to Guildford. In late April or early May, the betrothal was announced. Jane had protested the union but was persuaded by ‘the urgency of her mother and the violence of her father’; in other words, persuaded by verbal and physical abuse. Many have argued that Jane protested because she didn’t like Guildford. That is unlikely. He was handsome enough (like most of the Dudley men), fair-haired and about her age. He was arrogant and spoilt; his mother openly favored him. But he had no other documented flaws. When considered against other men of the age, he was a good match. Jane’s reservations centered on his father. She disliked and feared Dudley, as most people did. But the duke had a weapon against Jane which he would wield effectively – religion. She was a devout and committed Protestant. She didn’t want Mary as queen any more than he did. And, unlike Dudley, Jane’s desire was based on real principle, not simple greed. So on 25 May 1553, Jane married Guildford at the Dudley’s London residence, Durham House. It was one of the great homes of Tudor England; her sister Catherine was also married that day, to the earl of Pembroke’s heir. Orders, signed by the king, had been sent to the Master of the Wardrobe so that the grandest clothing and jewels could be used. Edward was supposed to attend but was far too ill. He did not watch as his cousin marched down the aisle, richly appareled in cloth of gold and silver, her red hair braided with pearls. For many, Jane and Guildford’s marriage marks the beginning of the attempt to change the line of succession. In reality, Edward VI had been pondering the problem for months. Ever since he became ill, he had wondered how to prevent his Catholic sister from becoming queen. His reasoning was purely religious. Edward was a devout Protestant; he wanted his nation, for its own sake, to remain Protestant. Just as Mary believed Catholicism was the path to righteousness, Edward believed in Protestantism. He was king, charge by God with responsibility for his people’s religious welfare. It was a sacred duty. For the sake of his immortal soul, Mary had to be prevented from leading England on the path to damnation. This necessity overcame all else. What was Henry VIII’s will when compared to divine retribution? It was the beginning of the end for Jane Grey. Edward’s Device for the Succession was eventually issued with the title Letters Patent for the Limitation of the Crown. It disinherited Mary and Elizabeth because they were ‘illegitimate and not lawfully begotten.’ Furthermore, they were only half-sisters of the king, not entitled to succeed him, and might marry foreign husbands who would ‘tend to the utter subversion of the commonwealth of this our realm.’ But Edward’s device would have no legal validity as long as Henry VIII’s 1544 Act of Succession was still acknowledged by parliament. But there was no time to wipe that law from the statute book. Instead, Dudley planned to gain support from government and then carry out a coup so quickly that its legality would not matter. To gain government support, he spent June 1553 persuading the Privy Council, judiciary, and various churchmen to endorse Edward’s device. The Lord Chief Justice, Sir Edward Montague, and the Archbishop of Canterbury, Thomas Cranmer, were uneasy; but Dudley was desperate and called them traitors. Furthermore, the king ordered them to obey. So the Letters Patent for the Limitation of the Crown was endorsed with the Great Seal on 21 June. It was recognized by the Lord Chancellor, the Privy Councilors, twenty-two peers of the realm, the Lord Mayor of London, various aldermen and sheriffs, the secretaries of state (including William Cecil, Elizabeth I’s great statesman), and various judges and churchmen. King Edward VI did not live long after this triumph. After months of agony, he died in the early evening of Thursday 6 July. Jane Grey, meanwhile, had been married to Guildford Dudley for almost six weeks. She disliked her in-laws more than she disliked her parents so, immediately after the marriage, returned to Suffolk Place at Westminster. From there, she moved to her parents’ new residence in London, a former Carthusian monastery they were converting into a grand home. Dudley’s wife, the duchess of Northumberland and Jane’s mother-in-law, was not happy with this arrangement. She informed the Greys that Edward VI was dying and Jane had been made heir to his throne; she must hold herself in readiness (in other words, come to the Dudley home.) Jane later said this was the first she knew of the king’s impending death. She didn’t believe the duchess and told her as much; she accused the Dudleys of lying so they could steal her away from her parents. The duchess accused the Greys of deliberating keeping Guildford and Jane apart. Such petty conflict indicated rougher waters ahead for all involved. In the end, there was no reason Jane should not be with her husband. She went to the Dudley’s residence, Durham House, and possibly consummated her marriage. But, after only a few days, she became ill and accused the Dudleys of poisoning her. The charge was ludicrous (she was the key to their political salvation) and showed a surprising lack of logic on Jane’s part. But the Dudleys were concerned with her physical and mental state. They sent her to Chelsea, Catherine Parr’s former home where Jane had been so happy. It was there that, on Sunday 9 July, Dudley’s eldest daughter, Mary Sidney, came to visit her; they were to leave Chelsea and go to Syon House, a former convent on the Thames which Dudley controlled. At this point, it is right to question Jane’s true knowledge of Dudley’s plans. Remember, even if she knew Dudley intended to make her queen, there was nothing she could do to prevent it. She was not stupid; the charge of poisoning was probably a result of nervousness and hysteria. She knew her own lineage. She knew that she was fourth in line for the English throne, after Mary, Elizabeth and her own mother Frances. She also knew that, for some reason, the Dudleys and her parents were desperate to marry her to Guildford as quickly as possible. She also watched her sister wed into another influential noble family on the same day. Something was afoot and she undoubtedly suspected Dudley’s plan. In the end, her awareness of the plot was undoubtedly a greater strain than ignorance. After all, she could do nothing to escape her family or in-laws. She was, quite literally, trapped. When she arrived at Syon House with Mary Sidney, she found her parents, in-laws, and a variety of distinguished nobles – the earls of Arundel, Huntington, and Pembroke, and the marquess of Northampton. They greeted her very pleasantly and then knelt before her in reverence. Jane was naturally embarrassed. Dudley, in his capacity as President of the Council, then announced Edward’s death. The young king had led a ‘virtuous life’ and always cared for his kingdom – cared enough to disinherit his unworthy sisters and appointed his cousin Jane as his successor. Jane was stunned. She may have suspected as much but the actual moment of declaration was too much for her. She muttered that she was ‘insufficient’ for the task. The Lords of the Council then took a solemn oath to shed their blood in defense of her claim. Jane murmured a quick prayer – if it was God’s will that she be queen, then she would trust in God to help her govern England for His glory. Her reaction was not what those gathered expected. She was not openly thrilled, excited, or even pleased. She made no stirring speech to raise their spirits – she simply uttered a prayer to God. Did Jane want to be queen? That is a much-debated question, impossible to answer. But whatever her desire, she was queen and – for nine long days – ruled England. She is very short and thin, but prettily shaped and graceful. She has small features and a well-made nose, the mouth flexible and the lips red. The eyebrows are arched and darker than her hair, which is nearly red. Her eyes are sparkling and reddish brown in color. Once in the Tower, Jane was installed in the royal apartments (now destroyed.) There, another rift occurred between her and the Dudleys, much more serious than the first. Jane was visited by the Lord Treasurer, the Marquess of Winchester, who brought a selection of the royal jewels for her to try on. Among them was the crown. Jane would later stress that she never asked for the crown – it was brought to her. Winchester asked her to check if it fitted properly. Jane would not. She had played at being queen for nearly twenty-four hours but this, the most sacred symbol of the monarchy, was another reminder of the danger – and importance – of her role. If she put it on, there was no turning back. This was how she viewed it. So she hesitated, would not take it from Winchester. He didn’t recognize her uneasiness. He told her to take it, remarking that another would be made to crown her husband king. It was then Jane realized the extent of Dudley’s duplicity. He had manipulated Edward, knowing the devout Protestant king wanted the throne to go to his equally devout cousin Jane; but, all along, Dudley simply wanted his own son crowned king. None of the lords cared whether England was a righteous nation; no one cared about Edward’s will. Instead, her royal blood was to be used to maintain Dudley’s control of England, to make his family into royalty. She was outraged and angry. And Jane was a Tudor herself, as proud of her royal background as she had a right to be. The Dudleys, that arrogant, pretentious family, had no right to exploit her. She told those assembled that she would gladly make Guildford a duke, but he would never be king. Guildford was present for this declaration. He rushed out and fetched his mother. The duchess, no admirer of Jane’s anyway, joined her son in an attack – Jane was an unnatural wife and behaved like a child; in the end, Jane did not give in. The duchess said Guildford would be leaving with her for Syon House. When they had left, Jane called in the earls of Arundel and Pembroke. They were ordered to prevent Guildford from leaving. Jane did not like her husband – she probably pitied him for he was a pawn as well – but they had to stay together. He was the consort to the monarch and could not act like a spoiled child. Later, Jane would tell Mary I’s officers this story, adding, ‘I was compelled to act as a woman who is obliged to live on good terms with her husband; nevertheless I was not only deluded by the duke and the Council, but maltreated by my husband and his mother.’ The battle, however, had been domestic. Jane would soon have much greater problems to confront. For, later that evening, the Sheriff of London and various heralds and trumpeters, marched to the Cross in Cheapside to proclaim Jane queen. The announcement was met with silence. Dudley understood popular opinion. He also recognized the limits of his support – after all, most of the nobles would not stand by him if things turned ugly. But he believed that a quick coup, eliminating all opposition, was the key to success. So he had to get hold of Mary and Elizabeth. Mary, the daughter of Katharine of Aragon, was much-loved by the English people. They had always been sympathetic to her mother’s plight; most believed Mary was legitimate, that Katharine had been forced aside by the king’s lust and Anne Boleyn’s ambition. Did Mary understand the importance of this support? She had been receiving regular letters from Dudley about her brother’s condition. They were accurate for Dudley wanted to remain in her good graces as long as possible. In early July, he sent summons for Mary to come to Edward’s deathbed. She set out from Hunsdon (an old palace in Hertfordshire) but had not traveled far before a message reached her – the summons was a trap. Mary, oddly for her, acted decisively and immediately turned back. With half a dozen attendants, she went to Kenninghall in East Anglia. She had friends there and, if need be, would be near the coast and safety in the Spanish Netherlands. When he realized she had fled, Dudley sent his son Robert after her. But they couldn’t capture her and, on 9 July, he was forced to act without her in his power. The Bishop of London, Nicholas Ridley, preached at St Paul’s Cross, calling Mary and Elizabeth bastards, and specifically singling out Mary as a papist who would destroy the true religion and make England the pawn of foreign powers. The next day, of course, Jane was proclaimed queen. But it was on that day that the Council received a letter from Mary. It expressed her surprise that they hadn’t announced her brother’s death to her, his heir; furthermore, they were commanded to proclaim her queen in London. They responded by reminding her of her illegitimacy and inability to inherit ‘the Crown Imperial of this realm’; she must demonstrate her obedience to the ‘Sovereign Lady Queen Jane’ and turn herself over to the authorities. It was hardly reassuring for Mary. Also, her old allies, the Spanish envoys, were not responding to her desperate pleas for help. Jane spent little time with her lords during her nine days as queen. She sent an order to the Master of the Wardrobe for twenty yards of velvet, twenty-five ells of fine Holland linen cloth, thirty-three ells of coarser material for lining; she also collected the royal jewels, a motley assortment of fish-shaped toothpicks and Henry VIII’s shaving materials. This reveals an important fact about Jane’s nine-day reign. She made no explicit political statements; she was Dudley’s puppet. He was the one who met with the council, he was the one who wanted to capture Mary Tudor; he was the one tried to shore up their perilous situation. When they fell from power, Jane never protested or attempted another coup. One can imagine that she felt relieved to be simply Lady Jane Grey again. Dudley spent the nine days attempting to strengthen their position. It was imperative to capture Mary; when that failed, he needed to at least track her movements. If he could reach her potential supporters first, there was a chance he could sway them to his side. Dudley undoubtedly feared that (like his father during Henry VIII’s reign), he would be the sacrificial lamb of Edward’s unsuccessful government. But he worked well under pressure, leaving Jane to fight domestic battles with her husband and mother-in-law. Elizabeth, meanwhile, remained in the country. She was no admirer of her half-sister Mary but knew that if Jane Grey was recognized as queen, her own claim to the crown was forfeit. So she chose the safest course – she remained quiet, neither supporting nor rejecting Jane. Like all of England and most of Europe, she was watching and waiting. It became evident on 11 July, just a day after her coronation, that Jane’s hold on England was flimsy at best. Dudley had prepared a letter for circulation to all the sheriffs and lieutenants in England; it announced Jane’s succession and ordered them to resist any appeal from Mary. But Dudley knew the issue would not be settled so easily. It would be decided on the field of battle. He was an experienced soldier and determined to succeed. So he ordered a muster on 12 July at Tothill Fields, offering 10 pence a day as pay (a very high rate.) Dudley intended to put Jane’s father, Henry Grey, in charge of this army and remain in London himself. He realized that most of his hold on the council was based on personal intimidation. Dudley did doubt their fidelity and he had every reason to doubt it. But he couldn’t turn back now. On 13 July he had his personal armor delivered and appointed a retinue to meet him at Durham Place. Afterwards, he addressed the councilors for the last time. They were to send reinforcements to meet him at Newmarket, he said, for he and his companions would need much support. They were leaving their wives and children behind, trusting in the loyalty of the council. And, Dudley warned, if any man thought to betray him or the queen, their punishment would be eternal. Remember, Dudley said, the oath you took ‘to this virtuous lady the Queen’s highness, who by your and our enticement is rather of force placed therein than by her own seeking and request.’ The assembled lords assured him of their loyalty; one of them said, ‘If we should shrink from you as one that were culpable, which of us can excuse himself as guiltless? Therefore herein your doubt is too far cast.’ Dudley’s final words? ‘I pray God it be so,’ he said and left for battle. It was not an auspicious beginning. As Dudley marched on, his situation became more perilous. Norwich, one of the wealthiest towns in England, declared Mary queen, as did Colchester, Devon, and Oxfordshire. Dudley had sent six royal ships to the port near Framlingham to cut off Mary’s possible escape; the ships deserted Dudley and, with crews and heavy guns, proclaimed Mary queen. Meanwhile, the loyal towns were sending money, men, and supplies. The ordinary Englishman, ordered by his lord to fight in Dudley’s army, refused to go. Dudley’s own army was – understandably – racked with dissension; no one wanted to be on the losing side. Once the news had reached London that the ships had deserted Dudley, the councilors decided to save themselves. They attempted to leave the Tower, where they had been stationed since Dudley’s departure. On the 16th of July, at about 7 o’clock in the evening, the main gates of the Tower were locked; they keys were delivered to Jane. Jane suspected one of the lords (possibly Winchester, the lord treasurer) of trying to leave the city. Meanwhile, she was continuing her rule – sending out letters signed ‘Jane the Quene’ which instructed her loyal subjects to suppress Mary’s rebellion. But she must have realized the futility of it all. She was just a teenage girl, inexperienced and frightened. It was simply a question of waiting for the end. On the 18th of July, most of her councilors had left the Tower on the pretext of visiting the French ambassador. In reality, they were planning a visit to the Imperial embassy. Once there, they assured Charles V’s envoys that they had always been loyal to Mary; they had been kept prisoner by Dudley, forced to declare Jane queen. But now they were free and determined to proclaim Mary queen of England. They did so around 5 o’clock in the evening, on Thursday, the 19th of July. London erupted into a joyous celebration. The foreign ambassadors were astonished, with the French envoy writing: ‘The atmosphere of this country and the nature of its people are so changeable that I am compelled to make my despatches correspondingly wavering and contradictory.’ They all agreed it owed more to Providence than anything else. Jane was terribly frightened. She had long fought with her parents but, upon becoming Dudley’s pawn, had sought support from them, particularly her father. He came to Jane as she ate supper that night and told her she was deposed. Together, they took down the cloth of estate from above her head. He ordered his men to leave their weapons and then went to Tower Hill. Those near him heard him mutter, ‘I am but one man.’ He proclaimed Mary queen and then left for his London residence. Jane was left alone in the Tower. Lady Throckmorton, one of her ladies-in-waiting, returned to the Tower for her duties but could not find Jane. She asked for the queen’s whereabouts and was told that the Lady Jane was now a prisoner, detained elsewhere in the Tower. Jane was in the deputy lieutenant’s house, awaiting her fate. The indignities began. Her belongings were sorted through, all her money confiscated; within the day, she was accused of stealing valuables from the royal wardrobe. Mary was riding to London, now accepted as queen. Dudley was arrested by his former ally, the earl of Arundel. His entire family was taken to the Tower; as they were marched through the streets, the crowd pelted them with filth and insults. Even the Imperial envoy called it ‘dreadful’ and ‘a strange mutation.’ For Dudley’s fall from power had been rapid, extraordinarily so – the nine days’ progress from ruler to traitor was a confusing mix of treachery, rumor, and disgrace. Mary did release Dudley’s wife from the Tower, almost immediately; the duchess hurried to the queen to beg for her family’s release. Mary ordered her from the city. Her cousin Frances, however, was more fortunate. She had a private audience with the queen. Within days, Henry Grey (who had been arrested at his London home and sent to the Tower on the 28th) was released. On 3 August, Mary made her state entry into London. As she rode past cheering crowds, clad in purple velvet and rich jewels, Jane Grey waited in prison, along with her husband and father-in-law. What would be their fate? All Europe pondered this, even as Jane prepared to plead her case. Jane Grey possessed the committed idealism of a religious fanatic and the events following her brief reign allowed her a place in history as a Protestant martyr. Her cousin Mary never questioned her passionate Catholicism; Jane did question her own Protestantism but the quest for spiritual meaning only reinforced her already strong convictions. Had she remained queen, there is every possibility she would have persecuted Catholics with the same energy Mary persecuted Protestants (thus earning the nickname ‘Bloody Mary.’) Instead, Jane’s fate was to be executed and later celebrated as a Protestant martyr, the greatest sacrificial lamb of Mary’s misguided policies. The truth is, of course, more complex. Mary did not execute Jane because of their religious differences. Rather, she was motivated by political necessity and her own desire to marry and reinstate the Catholic church in England. Mary was in the midst of arranging her marriage to Philip of Spain, the son and heir of Charles V. It was the culmination of a decades-old dream. She had spent the last few years in the countryside, surrounded by a Catholic household and sympathetic nobles. Thus, she never realized the extent of Protestantism in the vital areas of London and its surrounding countryside. Mary assumed all of England wanted to return to the early 1520s, the years before Henry VIII had decided to abandon her beloved mother and break with the church of Rome. Mary assumed that the popular support which had taken the throne from Jane indicated support not simply for her rule – but for Catholic rule in general. In this misguided view, she was initially supported by her most trusted political advisor – a Spaniard named Simon Renard, the newly arrived Imperial ambassador. Charles V had instructed Renard to guide Mary through the crucial first months of her reign. At first, signs were good – Mary attended Mass with her privy councilors but, on 12 August 1553, told her council that she would not ‘compel or constrain other men’s consciences.’ She hoped her subjects would open their hearts to the truth and, shortly thereafter, return to the religion she supported. Renard was also instructed to urge moderate punishment upon those who had supported Jane. Charles did not want his cousin to be too cruel; that would hurt her reputation. He needn’t have worried. Mary was, in fact, too lenient for Renard. ‘As to Jane of Suffolk, whom they tried to make Queen, she [Mary] could not be induced to consent that she should die.’ Mary firmly believed her cousin was innocent of any intrigue; Jane had never intended to be queen, but had been the unwilling dupe of Dudley. She could not put this innocent young woman to death. My masters, I let you all to understand that I do most faithfully believe this is the very right and true way, out of the which true religion you and I have been seduced these sixteen years past, by the false and erroneous preaching of the new preachers…. And I do believe the holy sacrament here most assuredly to be our Saviour and Redeemer Jesus Christ and this I pray you all to testify and pray for me. He died the next morning, before a great crowd of spectators. He repeated his speech at the mass; it had a great effect on the crowd. ‘I cannot but marvel at thee and lament thy case, who seemed sometime to be the lively member of Christ, but now the deformed imp of the devil; sometime the beautiful temple of God, but now the stinking and filthy kennel of Satan; sometime the unspotted spouse of Christ, but now the unshamefaced paramour of Antichrist; sometime my faithful brother, but now a stranger and apostate; sometime a stout Christian soldier, but now a cowardly runaway. Yea, when I consider these things, I cannot but speak to thee, and cry out upon thee, thou seed of Satan. Such rhetoric reveals insight into Jane’s character. She was pious, devout, and kind – but she was also self-righteous and intolerant. She and Mary were more alike than many realized. Both were plain-spoken, transparently honest, and passionately believed their religion was the sole path to salvation. While Mary prepared for her coronation, Jane remained in the Tower. The Dudley brothers were now allowed to exercise on the roof of their prison, Beauchamp Tower, though there is no evidence that Jane and Guildford saw one another. Mary did not speak of her imprisoned cousin. Her time was taken up with her coronation and impending marriage, as well as the conflict her marriage was causing. 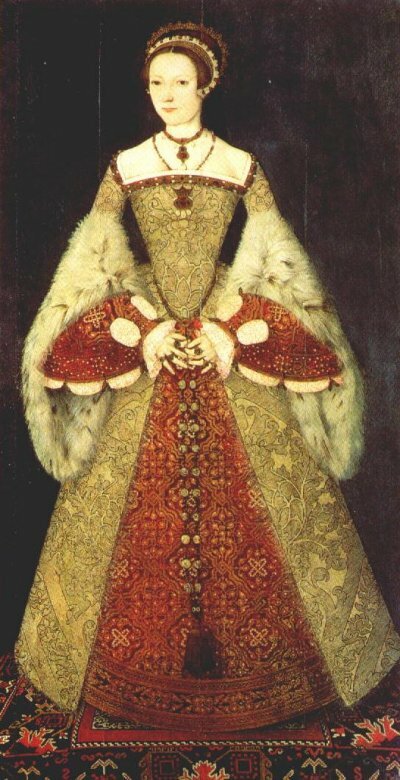 Most Englishmen did not want Mary to wed a Spaniard, for the same reasons Edward VI had excluded her from the succession – she was past middle-aged and would probably bear no children. Therefore, she would leave the throne to a Catholic husband and England would become yet another state of the Imperial empire. But as the weeks passed, Mary’s leniency began to be questioned. So Mary gave in to pressure and ordered Jane and the four Dudley sons to stand trial; the order had been prepared in mid-September but Mary did not allow the trial to take place until two months later. As they were led out of the Tower to be arraigned at Guildhall, the executioner walked before them. He carried an axe, as was the custom. Jane dressed soberly for the occasion, as befitted a proper young lady of the reformed church. She was clad all in black; she wore a black cloth gown, black cape trimmed with velvet, and a black French hood trimmed with velvet. At her girdle hung a prayer book also bound in black velvet. She held a book of prayers open in her hands as she walked behind Guildford. She was attended by her two ladies, Mrs Tilney and Mrs Jacob. The proceedings were a mere formality. Jane and the four Dudleys pled guilty to the charge of high treason. Sentence was passed against them; the men would be hung, drawn, and quartered and Jane would be burnt or beheaded at the Queen’s pleasure. They returned to the Tower, this time with the edge of the axe turned towards them. In this way, spectators knew they were condemned. But the passing of the sentence was simply a formality. As Renard reported in his subsequent dispatches, ‘It is believed that Jane will not die’ and, a week later, ‘As for Jane, I am told her life is safe.’ Meanwhile, her parents had left the reformed church. Henry Grey was forced to pay a 20000 pd fine but given a general pardon. He returned to court. His wife was Queen Mary’s favorite lady and their two daughters, Catherine and Mary, were her ladies-in-waiting. In fact, Frances Grey was shown great favor at court, even gaining precedence over Princess Elizabeth. Most observers believed Jane would soon be pardoned and released, free to join her family at court. The rehabilitation of the Greys seemed complete. However, Mary’s fervent desire to wed Philip of Spain was soon to have tragic consequences for the sixteen-year-old Jane Grey. The complexities of Mary Tudor’s decision to marry the twenty-six widower, Philip of Spain, are discussed at her website. They can be outlined briefly here. Mary – and most of her contemporaries – believed she must marry; she needed a husband for support and guidance. No woman had ruled England in her own right before. Most Englishmen wanted Mary to wed the great-grandson of Edward IV, Edward Courtenay. He was the last of the Plantagenets, young, good-looking, and charming; his high birth led him to spend most of his youth in prison. Mary was kind to him. She released him from the Tower and restored he and his mother to favor. She remembered that Edward’s parents had supported her mother during the great divorce. But she also made it clear she would not marry him. For Mary, whose life had possessed little happiness and peace after her adolescence, had always turned to her mother’s family for advice and support. And she continued to do so when she became queen. Certainly Philip of Spain, heir to the Hapsburg empire, was the most sought-after prince in Europe. But he was also the grandson of her aunt, which meant a great deal to the sentimental Mary Tudor. Still, she did not immediately plan to marry him. She was deeply religious and had spent the past twenty years essentially alone and unloved. She was naturally fearful of marriage. She asked Renard – was Philip too young for her? would she be able to satisfy him for she was ignorant of ‘that which was called love’ ? In short, she was a deeply devout and chaste maiden and he was a twenty-six-year-old widower. Would he be happy with her? Renard assured her that Philip was delighted to wed Mary. And, he added, they would have children together, providing England with a Catholic succession. Mary replied that she had never considered marriage until God had raised her to the throne but – now that she was queen – she would lead her subjects down the path of righteousness. With the might of the Holy Roman Empire behind her, her faith would be triumphant. So she agreed to marry Philip in late October 1553; their engagement was made official. She was faced with a hostile reaction. Both her subjects and the king of France made their anger known. Many Englishmen believed Charles V wanted to drag England into war against France, another costly and ineffectual enterprise. In truth, Charles really wanted control of that vital sea route between Spain and the Netherlands; he needed to control the English coast in order for his trade route to operate at its maximum profitability. But England has always been an insular nation. With Protestant propagandists and the French ambassador spreading all sorts of rumors (from Spanish invasions to immediate wars), the people were in an uproar. Furthermore, Mary’s councilors were an ineffectual bunch and their policies were roundly criticized. It seemed that, just months into her reign, Mary was steadily falling from favor. On 2 January 1554, Charles V’s envoys arrived to iron out the details of the marriage contract. To secure his valuable trade route, Charles was prepared to be generous. In fact, he included every provision possible to stifle English fears. But it was no use. The people didn’t want the marriage. Soon enough, word reached London of uprisings in the countryside – Carew in Devonshire, Wyatt in Kent, Crofts in Wales…. The councilors were alarmed. And then word reached them that Henry Grey, the duke of Suffolk, had disappeared from his country home, Sheen. They had planned the uprising for March when Philip was due to arrive but Courtenay, timid after years in the Tower, betrayed them. So the conspirators were forced into action. Carew could not raise his force without Courtenay’s help so he fled to France and Crofts plans fell through. But, by the end of January, Wyatt had taken Rochester and the royal ships at the Medway. The duke of Norfolk left with a force from London but many men deserted. Wyatt was encouraged and pressed on to London. For two days, the fate of the Spanish marriage hung in the balance. Londoners were undecided; Mary decided to sway the balance. She went to Guildhall and made a rousing speech exhorting the Londoners to support her. She did so against the advice of her council for they feared for her safety. They needn’t have worried. When Wyatt reached London, he found the bridge closed to him. Mary had refused to let the Tower guns be turned on the traitors. She feared the innocent citizens of Southwark would be harmed if they were fired. The rebels eventually surrendered but Mary had learned a valuable lesson – she discovered the depth of her subjects’ hatred of the Spanish marriage. But it did not cause her to change her plans. She was bewildered and angry but also hurt. She had shown mercy and forgiveness and was rewarded by rebellion. She was now particularly susceptible to Renard’s advice. Renard immediately questioned Mary’s safety as well as Philip’s – would the prince be safe when rebellions were occurring throughout the nation? The queen was exhorted to ensure his safety. She must do this by punishing the rebels so none would dare rebel again. Renard’s advice was supported by Mary’s council. Inevitably, all her advisors urged Mary to execute Jane Grey. Wyatt had been supported by the vanished Henry Grey. When he had disappeared from Sheen, he had gone to raise an army against the Spanish marriage. But he gained little support. Grey owed his life to Mary’s kindness and he responded by seeking to overthrow her. His intent was to lead men of the midland shires and join Wyatt near London. His actual course fell far short of this goal – he fled from one county to another until he reached his manor of Astley. He apparently hid in a tree trunk or under some hay; accounts vary. He was promptly arrested by the earl of Huntingdon. Later, rumors spread that he had proclaimed Jane queen during his ride through the midlands. This was untrue but it didn’t matter. Jane had once been queen and, as Mary’s advisors put it, she would be the figurehead of any Protestant plot. Once again, she was morally innocent but she was still dangerous. She had to die. To this, Renard added that Philip could not arrive until the Protestant threat had been destroyed. All the opposition to her marriage had simply made the obstinate Mary more determined to marry Philip. So the suspended sentence on Jane was revoked and she was condemned to die immediately. Feckenham’s work had delayed the executions until Monday 12 February. Meanwhile, Jane was also preparing to die with as much grace and dignity she could summon. She chose her dress, composed her speech, and appointed the two members of her household who would accompany her and dispose of her body. She sent a letter to her sister Catherine and one to her father (brought to the Tower on 10 February.) The latter included a remonstration that his actions had hastened her death. But she did not write to her mother nor did Frances attempt to visit her or her husband. There exists a story that Guildford asked to see Jane before they died and that Mary granted his request. Jane, however, refused to see him, waiting until they met ‘in a better place.’ But there is no evidence the story is true. In fact, Jane and her husband showed no interest in seeing one another while in the Tower. Jane did watch her husband’s execution. He was taken from Beauchamp Tower at 10 o’clock in the morning and led to the execution area on Tower Hill. Jane stood by her window and watched as he went to his death. Guildford died with great courage and dignity and, when the cart rolled past carrying his corpse, Jane muttered his name and a comment about ‘the bitterness of death.’ Perhaps she realized that he had been a victim, too. In any case, she saw his blood-splattered body, thrown atop equally stained straw, driven to St Peter-ad-Vincula; his head was wrapped in a cloth beside the body. It was now Jane’s turn to face death. (Click here to read an eyewitness account of her execution.) She wore the same black outfit she had worn at her trial. She carried her prayer book in her hands; she was escorted by Sir John Brydges, the lieutenant of the Tower. Her nurse, Mrs Ellen, and her attendant, Mrs Tylney, also accompanied her. They both cried but Jane was calm and composed. She had, after all, watched her scaffold being erected near the White Tower; her rooms provided an excellent view of its construction. Since she was a princess of royal blood, her execution was private. Only a small crowd had been invited. At the steps of the scaffold, she greeted Feckenham: ‘God grant you all your desires and accept my own hearty thanks for all your attention to me. Although indeed, those attentions have tried me more than death can now terrify me.’ She then ascended the steps and addressed the crowd. She admitted she had committed treason when she accepted the crown but ‘I do wash my hands in innocency, before God and the face of you, good Christian people this day.’ She wrung her hands and asked that they witness her death, and affirm that she died a good Christian. She ended with yet another indication of her strong Protestant faith; she said, ‘And now, good people, while I am alive, I pray you to assist me with your prayers.’ Protestants, unlike Catholics, did not believe in prayers for the dead. She then knelt and asked Feckenham, ‘Shall I say this psalm?’ She read the fifty-first psalm in English and he followed her in Latin. Now there was nothing to do but end it all. The executioner asked her to stand upon the straw. Perhaps she saw the actual block for the first time. Her composure faltered for just a brief moment. She whispered, ‘I pray you despatch me quickly,’ and began to kneel. She hesitated and asked, ‘Will you take it off before I lay me down?’, referring to the blindfold. The executioner replied, ‘No, madame’ and so she tied the handkerchief around her eyes. She then knelt but, blindfolded, could not find the block. Her arms flailed about for several moments and she cried out, ‘What shall I do? Where is it?’ Those standing on the scaffold were hesitant – should they help her? A member of the crowd climbed the scaffold and helped her. He guided her hands to the block. She lowered her head and stretched forth her body; her last words were, ‘Lord into thy hands I commend my spirit.’ The executioner swung his axe and severed her head. Blood splattered across the scaffold and many of the witnesses. The executioner then lifted her head and said, ‘So perish all the Queen’s enemies. Behold, the head of a traitor.’ It was the end of Lady Jane Grey. Permission had to be granted for her burial at St Peter-ad-Vincula since the church had recently become Catholic again. Feckenham was forced to go to court for the permission. So Jane’s body lay exposed and unattended for nearly four hours, spread obscenely across the blood-soaked straw. The French ambassador reported seeing it there hours after the execution. Her attendants kept watch, though they were not allowed to cover the corpse. Finally, Feckenham returned and Jane’s body was laid to rest between the bodies of two other headless queens – Anne Boleyn and Catherine Howard. During the reign of her Protestant cousin, Queen Elizabeth I, Jane was celebrated as a martyr to her faith and she remains one of the most famous queens of England.